There's a lot going on in the world today. There are more refugees in the world today than there have been since the end of World War II. China is claiming and militarizing the entire South China Sea, threatening clashes with several countries. Europe is facing existential threats with both finances and refugees. The Mideast has ongoing wars in Syria, Iraq, Afghanistan, Yemen and Libya. Relations between Russia and Nato are reaching cold war levels. Almost every day, something new happens that a few years ago you would have to have been crazy to believe would ever happen. Just one miscalculation by one person could result in a war that spirals into something really major. The entire internet, including my web site, could instantly become unavailable. Add to that the fact that I, like anyone else, could be hit by a bus tomorrow. Anyone of these events could mean the immediate disappearance of my web site and almost 15 years of work that I put into developing Generational Dynamics would be gone. So on this page I'm providing downloads of all the major documents and files, over six million words of text. I would like to ask as many people as possible to download these files and save them somewhere, so that if ten years from now someone is looking for the information about Generational Dynamics, then somebody somewhere will still have a copy, and the work will survive. 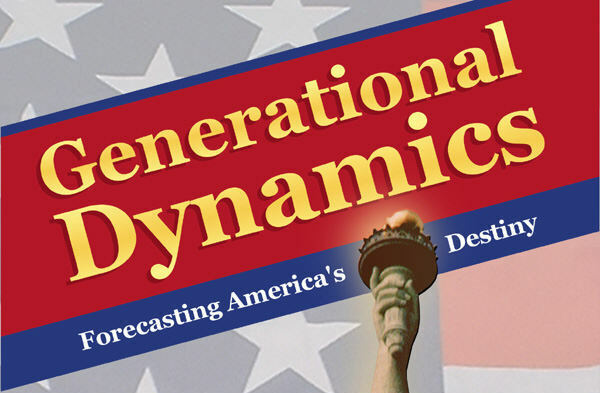 The purpose is to protect the Generational Dynamics legacy, and to make sure that this work is preserved, and available to researchers who write books, professors who teach courses, and governments that make policy. The file types of the files in the zip files on this page are plain text, text/html, images (jpg, gif, png), and pdf. There are no executable files. You have my permission to use any of this stuff on a "fair use" basis, giving credit and links back to the Generational Dynamics web site. Once again, I'd like to ask as many people as possible to download these files and save them on a disk somewhere, in order to protect the legacy of Generational Dynamics. Thanks. There are three books and a white paper available in PDF format. The following zip files contain only plain text files. These text files are used as input to my software to produce HTML pages for my web site. The text also contains macros that are translated into HTML for links and images, but it's easy to see what's going on. You do not need the software to interpret these files, as the text is all you need. Neil Howe killed the Fourth Turning Forum on May 16, 2016. Prior to that date, he asked people to copy and save any threads and contents that they need or want, and he asked the forum community to go and start up a new Fourth Turning Forum. As a service to the Fourth Turning community, the Generational Dynamics web site is pleased to present an archive of many of the threads in the old Fourth Turning Forum. That archive is available here: http://generationaldynamics.com/tftarchive/. I joined the Fourth Turning Forum as a member in 2003, and much of the development of Generational Dynamics was done in conversations on that forum, so a lot of information in the Fourth Turning archive is relevant to the development of Generational Dynamics. Furthermore, preserving the Generational Dynamics legacy should also include preserving at least a portion of the Fourth Turning legacy. The following zip file contains text/html files for all the pages in the Fourth Turning archive.